*** The Final Update of Project Right has been posted. Time for another quick update on Project Right. Part one can be found here. 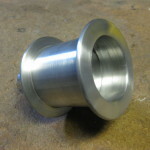 Frame builder Rob English has continued machining on the hub, which now is almost completely finished, it’s needing just some polishing, spoke holes, splines and anodizing. I think an interesting point is the non-conventional look and design of the rear hub. 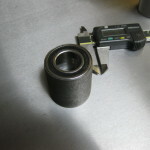 As you can see the rear hub is not terribly heavy at 174 grams, and will still get a bit lighter. 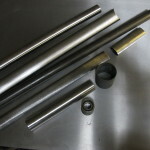 Also shown is a selection of frame tubes to be used. In the photo of the frame tubes, from top to bottom we have S3, Columbus Aero, Straight gauge seattube (still a lot of work to get this tube butted and shaped) and then some ovalized chainstay and a headtube stock. The size of the stays and downtube make the 1.125″ headtube look a little small to me. The 2nd to last photo shows the seat tube being externally butted, after which it will still have to be ovalized. 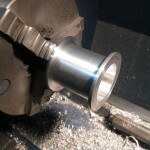 The last photo shows what looks to be a bottom bracket shell with press fit bearings, however it’s definitely not a bb shell as that’s shown at the same time in the tubing picture. 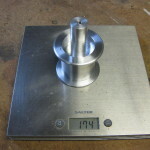 174 grams and will get lighter still. S3, Columbus aero, seattube, oval stays and headtube. 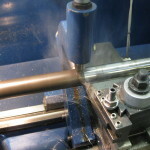 Seat tube being butted externally. Looks like a bottom bracket but isn’t. Right monoblade fixie? I like it! A COMPLEtely ASYMMETrical STEel TIMETrial WEAPon??? Go ROb!